We have recently added an exciting range of Cleancraft cleaning machines to the Top Cleaning Supplies website. The Cleancraft machines range includes vacuum cleaners, ride on scrubber dryers, pressure washers and wet vacs to provide powerful cleaning performance for a huge range of professional and domestic cleaning tasks. Cleancraft cleaning machines have been developed, designed and manufactured with ease of use, practicality and durability at the forefront, resulting in professional grade cleaning machines which will help you to achieve incredible results fast! The machine’s components are manufactured with high quality materials which ensure a reliable, long-life machine. The plastic or stainless steel casings of the cleaning machines not only look good, they provide a highly durable, protective shell to ensure a robust machine which will withstand daily heavy duty and industrial cleaning tasks. Cleancraft machines have been designed to include a range of practical features to ensure their versatility and ease of use. One of our favourite features of Cleancraft vacuum cleaners is their built-in device socket which allows you to plug your power tool, such as a drill or power saw, directly into the machine. This eliminates the need for a separate power supply to power your tools. Various safety features are built in to the cleaning machines. Cleancraft scrubber dryers feature automatic detachment of the vacuum rail in case of an impact to help to avoid damage. They also feature an emergency stop button and automatic speed reduction on bends. Cleancraft machines are designed to be easy to manoeuvre, transport and store. Larger capacity vacuum cleaners come complete with a robust steel chassis to ensure safe transportation of the machine over rough ground. Even when the tank is full and heavy, it can be manouevred safely thanks to the stable chassis. With some models within the Cleancraft range featuring fold-away handles, storage of the machine is made more practical where space may be tight. Some Cleancraft machines feature an Eco Mode function. While the machine is in this mode, the detergent dose, energy consumption and noise level are reduced to provide an eco friendly choice of machine whilst maintaining a powerful cleaning performance. With up to 3 powerful suction motors built in, Cleancraft vacuum cleaners deliver incredible cleaning power for the most demanding tasks. With separate power switches for the motors, you can also save power for lighter cleaning jobs. With their nanotech filters, fine dust and particulate matter is vacuumed away and trapped to provide a superior vacuum cleaning solution. Cleancraft scrubber dryers provide clean and dry flooring fast! Floors are dried and safe to use with just one pass of the machine thanks to the heavy duty vacuum rail. The scrubber dryer’s powerful brush disks ensure deep down cleaning, even on textured flooring, while large solution and recovery tanks mean that there is less downtime to empty and re-fill the tanks. 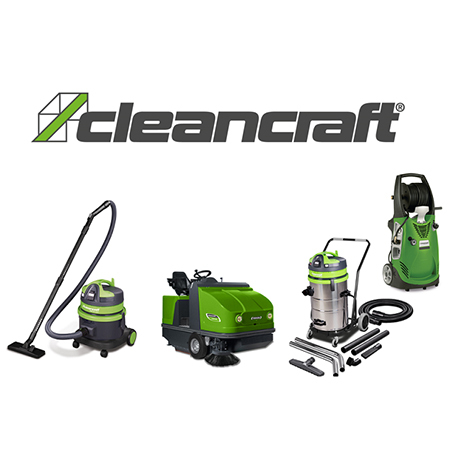 To learn more about the range, click to see all currently available Cleancraft cleaning machines.